As we have discussed over the past few weeks, coil binding is an effective way to market as presentation material or proposals. 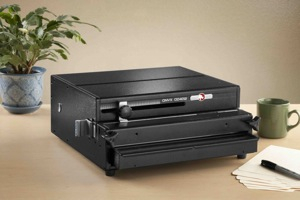 Llloyds of Indiana has put together a coil binding demonstration to help you understand how easy it is to bind a document using your laser printer. The coil binding machine we are using is a multi-die Rhin-O-Tuff machine that can punch coil, comb or wire for document binding. There are many coil binding machines available that can do multi-document finishing including coil, comb or wire. Finishing the document is simple as you will see. Coil binding comb comes in many sizes and colors. You can match your marketing colors to both coil and covers. As the coil binding demonstration shows, it is very easy.